Global packaging and shipping company PACK & SEND International started having major problems with a file server in their Sydney headquarters supporting users throughout the company. The problems with this file server, running Windows Server 2003, were related to low free space and paged memory errors. After researching the issues, Stephen Krauklis, Software Development Manager at PACK & SEND, determined that heavy fragmentation was a likely culprit, or at least a contributing factor. 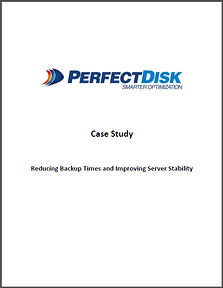 "Greatly improved our backup times (from 12+ hours down to 3.5 hours)." Lack of free space was a concern but the answer wasn’t as simple as merely adding additional storage -- backups were already consuming too much time, taking over 12 hours to complete. Adding more storage would increase backup time, resulting in backups running during business hours, which was highly undesirable due to their impact on performance and user productivity.